Snowden is a hero in my mind. I'm tired of the lies and half truths of our government. The classify so much crap it is insane. I've read nothing that has been leaked that is of value. We have to be the most paranoid nation of all times! Beetle-brain James Cr@pper again is hiding behind the terrorist paranoia; he can't explain why his agency needs to harvest and forever store EVERY American citizen's personal communications and internet activity to "protect" us. Well Edward, I hope you had a nice Christmas and New Year! Being that you're away from your family and decent hard working Americans because you're a traitor. Such is to be expected from someone like you with your obvious limitations, Texan. You sound like a hateful Tea Partier. Are you one by some chance? Most enlightened Americans disagree with your opinions. Just another ignorant Texan – goes to prove that they are everywhere – Grade Four must have been too difficult ! Sleepy "TEXAN" seems to have no problem in surrendering more of his freedom in exchange for added "security." I wonder how "TEXAN" will react when his big-brother surveillance government confiscates his gun, because the next mission of big government will be to disarm its citizens. Texan? Are you from Bush's land? Read this. Snowden sacrifices a good life in his country and went to live in exile, he did it for his countrymen, unfortunately he included people like you. Someone just needs to murder Clapper already. On the other hand Greg, I think James Clapper needs to be incarcerated for the rest of his miserable life and never see the light of day again!!! Clapper just needs to be murdered already. If the head of U.S. intelligence wants to you to do something these days, the right thing to do is the exact opposite. Godspeed Mr. Snowden. One of the last patriots in the world where most people have forgotten the meaning of the word. Clapper and the entire NSA has proven to be corrupt beyond measure and should be on trial for high treason. Snowden must surrender himself to US authorities. nuf said. Thank you Phunnie boy, for trying to make me look stupid. 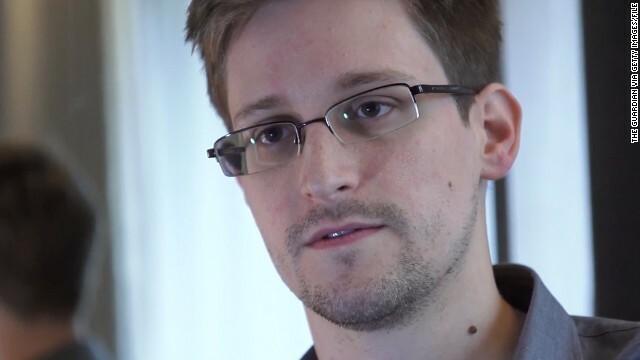 Edward Snowden did this country a great favor and you know it! He sorely needs to be exonerated and that's all there is to it!!! Moreover, it's James Clapper and his unsavory henchmen who need to be indicted and tried. Evidently CNN didn't like what I said in favor of Edward Snowden since my post has been blocked. Sorry folks, I did not say that. CNN never blocks my posts. I have generally positive feelings about Edward Snowden. I believe that the conversation the Government and it's representatives are having right now is entirely due to his revelations. I believe that he has served the purpose that he set out to do. However, there may be some things that do not pertain to DOMESTIC spying which he shouldn't disclose and can hamper some anti-terrorism measures. I don't think that the U.S. Government should be spying on it's allied leaders, but maybe some leaders of foreign powers that aren't so friendly might be a good idea. Maybe it is time for Mr. Snowden to stop, unless he has further revelations of Government overreach in terms of Domestic spying. Otherwise, the military may find a way to blame him for an attack in the future. You'll know that they'll at least try. As usual our canadian friends have a pretty logical view of the reality at hand. Our Canadian Government, ( Harper, and his gang of merry men) have done the very same spying on us. and it should be exposed that they have been doing it a long time, Snowden did the American people a favor by exposing the underhanded actions their Government committed, but there needs to be a line, when you expose government files to the public and enemies can gain traction, and the result is the death of American service personnel, or breeding terror from an otherwise friendly country, i think there needs to be some discussion on that. If you had a way to succeed at generating change, and not getting put down for stealing and publicizing secret info this is probably the last chance they are going to give you. People understand what they did. All you are doing now is damaging the country. At the end of the day this is my country, not the NSA's and if you turned down this opportunity I have nothing to say to the congressmen who opted to off you. Only thing I really disagree with is the 'act of war' lines on spying. Sorry bud even your own precious norwegian gov does it. The rest well im not fat and i have no credit card so your stats dont really apply. So, exposing the rampant and wide-spread abuses of the government is "damaging the country"? I'd say that started happening years ago, when someone in charge decided it was okay to violate the law of the land and spy on its citizens. If you want to talk about damaging the country, riddle me this: if the government has been spying on everything going on in-countryas well as with foreign powers for the last ten years, that would mean they knew about the Boston bombers. Why didn't someone stop them? If you are here talking about it , he has exposed it. We know. Point taken. Job done. Anything more is not necessary. Personally I hope he does some soul searching. If he stops he kind of did win. We are all talking about this, and there were some legitimate things he SHOULD have exposed. LOTS of what he is doing has no purpose. Even he has called what is happening a victory. So chill out and relax man. Think logically. You are the only source of feedback for proposed changes. IF you force their hand and refuse to stop now that you made the change you desired, if they kill you, who do we have to look to for feedback on the changes? You are doing us no favors no matter how you hash it. The debate RAGES here. You won. But I demand they stop the leaks. It has gone to far. It IS making me live in more danger than I was in before you. Regardless of if the program ever made us safer, you exposing it made us less safe. Now it is exposed. Quit while you are ahead. If you gave back the data and stopped releasing more Im sure most people would defend your life. Right now though you have put me in more danger than I was in .